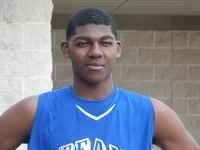 One of fastest rising 2017 Student Athletes out of the State of Texas is 6’8″ Post Elafayette Stone of Copperas Cove HS. Elafayette has been showing out and caught the attention of Mid Major Hoops Report this High School Season. Mid Major Hoops Report has brought him to our “Players Corner” where we at MMHR are proud to highlight him as one of the up and coming prospects in the 2017 Class…. MMHR: What is your official height and weight? MMHR: What position do you see yourself playing in college? ES: I see myself playing the Power Forward position. MMHR: What AAU team are you playing with this year? MMHR: Describe your game for coaches and fans who haven’t seen you play yet? ES: I’m a good big man who is dependable on both ends of the court. I like to play defense and rebound for my team. MMHR: What makes you stand out the most from other players you compete against? ES: I am a leader in the locker first and foremost. MMHR: What part of your game do you feel like you’ve improved on the most in the last year? ES: jumper, free throws, and my ball handling. MMHR: What aspect of your game are you working the hardest on to improve? ES: ball handling, my hands, rebounding. MMHR: What schools have shown strong interest so far? MMHR: Do you have a top five to ten schools you’re looking at right now? ES: Kentucky, Georgia, and Creighton all i have right now. MMHR: Would you prefer to play college basketball close to home, or is that not a factor for you? ES: It’s not a factor, I just want to play at the highest level possible. MMHR: How hard do you work on your game? How much time do you put in? ES: I try to work as hard as i can everyday im in the gym til late at night. MMHR: How old were you when you first picked up a basketball? MMHR: What things are really important to you when it comes to choosing where to play college basketball? MMHR: Who are some of the mentors who helped you get to where you are right now? ES: My 7th grade coach Greg Sullivan. MMHR: What’s your favorite moment as a basketball player so far? ES: Getting my first dunk in a game. MMHR: What are your short term goals as a basketball player? ES: Get a scholarship and play at a high level. MMHR: What are your long term goals? ES: Graduate college and try my hardest to make an NBA roster. MMHR: Do you have a Facebook or Twitter you would like to share with us? MMHR: What style of play do you prefer? ES: Up tempo and fundamental basketball. MMHR: Who’s a player in college or the NBA that you really respect? ES: James Harden of the OKC Thunder. MMHR: Do you prefer Nike, adidas, or Under Armour? MMHR would like to Thank the Stone Family for making this Interview happen. Good luck on the rest of your season.